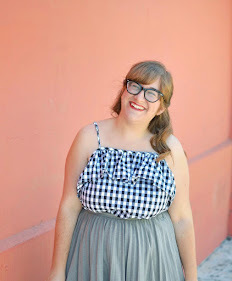 Finally, for the first time in what feels like forever, I have an outfit post. Fine, it really hasn't been that long, but my internal blogging clock (get it? Like body clock? Oh, man.) has been pretty off lately. This isn't my most exciting outfit by any means, but it was the first time I really felt like myself in a while. Maybe it's because it was the first time I had worn a Peter Pan collar in some time or maybe it was just that this dress makes me feel good, but either way, I was happy in this. I think I'm starting to come to terms with the fact that I struggle with being stylish in the winter, and that's okay. Winter is for heavy coats, snow boots, and avoiding frostbite. If I walk outside in anything other than sweats, then I'm doing my job of a fashion student. And since I've never actually left the house in sweats (at least in recent memory), I'd say I'm doing pretty well for myself. You guys, I'm not even joking about this. It's a tried and true system. Other than spending far too much time contemplating leg wear, my life has been pretty boring. This weekend, I hung out with some friends, got some ridiculously cheap DVDs at a store closing sale (I'm still in mourning), and saw "The Lego Movie." I can't stress enough how seriously awesome the movie was. A couple of friends of mine made fun of me for going to see it, but I assure you, it's definitely not just a kids' movie. The pop culture references are very much geared toward adults, the voice cast is amazing (Chris Pratt, Charlie Day, Will Arnett, Nick Offerman, Alison Brie...need I go on? ), and the humor is sharp. I can't remember the last time I saw an animated movie this fantastic, let alone one that had a 95% on Rotten Tomatoes. Plus, if you grew up playing with your brother's hand-me-down Legos like I did, you can't beat that nostalgia factor. I have no regrets in spending an entire paragraph of a blog post trying to get my readers to go see "The Lego Movie." None at all. I loved the Legos movie too! The red skirt is bright and cheering- a good pick me up in the midst of winter. It gets so cold here I end up wearing my fleece lined leggings under pants. BOO! I love this bright red dress as a skirt, it looks perfect with the knit sweater overtop! Hopefully the weather will get better for both of us soon! I guess I need to add the lego movie to my list of must sees! That sweater is so nice! I really like it! That sounds like and excellent dressing system to me! I love the sweet collar peeking through on this, you look adorable! That's an excellent system, but sometimes I'm too much of a baby and need to wear pants below 30 degrees!! I am trying to wear more skirts and dresses this winter, but so far the weather has been brutal! Love your top! Holy moly that sounds FREEZING! I'm glad I don't have to deal with weather that cold very often. I'd love to see one of your cold day looks, for sure, so I'm looking forward to that pants post! I love the detailing on your sweater! I totally feel the frustration with taking photos in the cold. I had to throw sunglasses on today in the cold, because my eyes were watering so much that my makeup was running. Also, if you're sad about Capitol closing after you've only lived here four years, imagine growing up always living near one. Sadly, the Gburg store closed a few years ago. It's just not right. The internet is killing everything. Next thing you know, people won't even read fashion magazines because blogs will take over. And so then I can blame that on you too. Good system for keeping your legs warm! I cannot keep to that dress code, because I would be living in pants everyday and no one likes that. I love this dress and boots together! Now I'm pumped to see the Lego Movie! And I've been hearing awesome things about The Lego Movie, I'll have to go check it out! haha, i guess we all have some.sort of systems for.different things, i.couldn't.imagine having one.in that.weather though...i live.in the caribbean,.where winter does not exist....and i love.it! I heard the Lego movie was awesome! I need to see it. Plus I love animated films so I'll see it eventually. In other news - it's that dress we both have yay! I love how you layered that sweater over it. I need to try some layering with mine! I seriously feel like you shouldn't have to leave the house when it's this cold- it should be illegal! :) I love this dress and it sounds like you have the perfect system! I can't imagine you in pants. Hell, I can't imagine myself in pants, but I wore leggings...pretty close, right? Red looks really good on you! I find that exact system works for me too - if it's too cold, there's absolutely no way I'm baring my legs - even for the blog. And this outfit is so cute! Love the pop of red! Cute look, love your outfit weather scale.